Vatican City, Jun 21, 2017 / 01:08 pm (CNA/EWTN News).- Pope Francis addressed members of the National Football League Hall of Fame on Wednesday, encouraging them to promote the values of sportsmen not only on the field but also within their communities. “Teamwork, fair play and the pursuit of personal excellence are the values – in the religious sense, we can say virtues – that have guided your own commitment on the field,” said the Pope, meeting with the hall-of-famers on June 21. He addressed the need for role models in the world, especially for youth, teaching them to live out their “God-given gifts and talents,” showing how to bring out the best in each person and leading the way to a better future. Established in 1963, the American Pro Football Hall of Fame is located in Canton, Ohio, the same city where the NFL was created about 40 years earlier. It contains 310 members, 7 of whom will be formally inducted in August. Present at the group meeting with Pope Francis was Jerry Jones, owner of the Dallas Cowboys, and six other hall of fame inductees: Chris Doleman, Franco Harris, Floyd Little, Ronnie Lott Curtis Martin, and Jim Taylor. 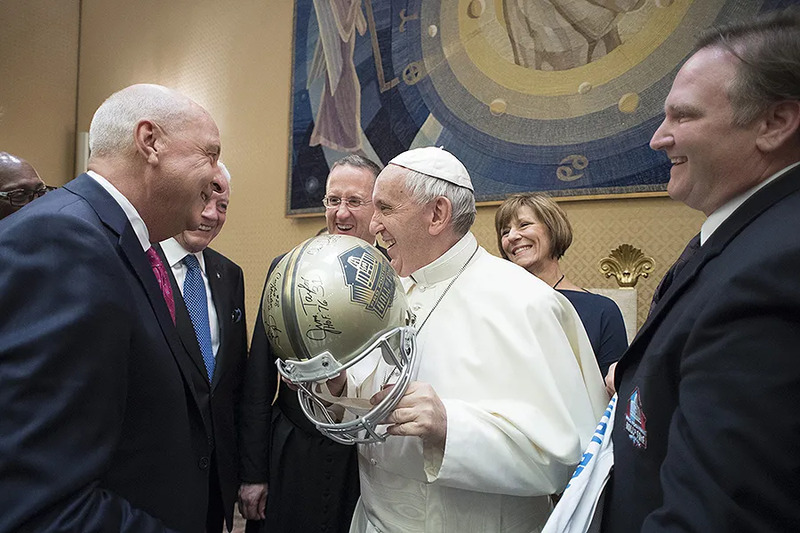 They presented him with a signed helmet and jersey with “Papa Francesco” written on the back. “I am an avid follower of ‘football’, but where I come from, the game is played very differently,” he said. Pope Francis is a member of the Club Atlético San Lorenzo de Almagro, located in Buenos Aires, the capital of Argentina. The club, nicknamed the Saints of Boedo, was founded in 1908 by a group of young men, including a priest. Being a fan of sports himself, the Pope has reflected on the virtues of sportsmanship before. Last October, at a Vatican conference called “Sport at the Service of Humanity,” he said the values fostered by sports not only promote health and recreation, but also the ability to play on a team, and to humbly win or lose. At the end of his address to the NFL Hall of Fame delegation, Pope Francis expressed hope that their visit to Rome will increase their gratitude for these gifts and enable them to share it with the rest of the world. 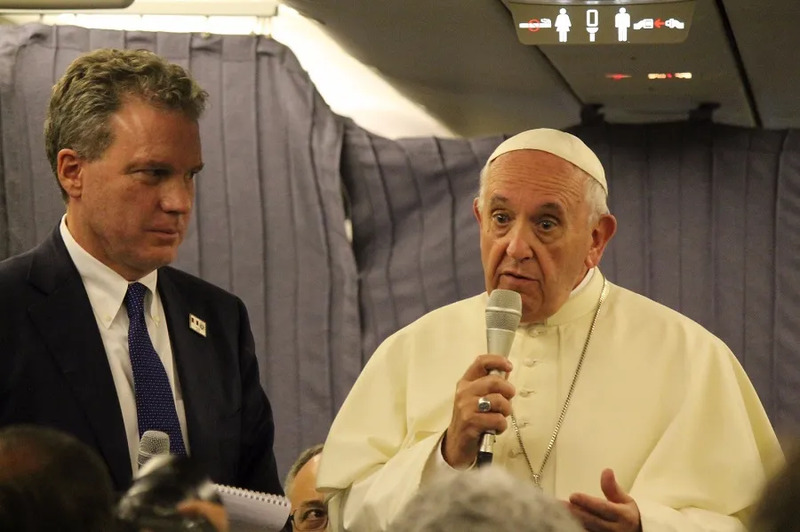 Vatican City, Jan 22, 2018 / 08:31 am (CNA/EWTN News).- Aboard the papal plane from Lima to Rome Sunday, Pope Francis said that comments made to Chilean journalists Jan. 18 were not intended to cause pain for victims of clerical sexual abuse. O’Malley is also the head of the Pontifical Commission for the Protection of Minors, which just concluded a 3-year mandate in December. The Vatican has not issued any statements on the the commission since its expiration, causing some to speculate on the future of its existence. However, in the most recent meetings of the Council of Cardinals, O’Malley spoke on the commission’s continued work, explaining that it is in the Pope’s hands to decide whether to reconfirm current members and whom to appoint as new members. Vatican City, Nov 15, 2018 / 04:13 pm (CNA/EWTN News).- Pope Francis encouraged the community of the Pontifical Latin American College Thursday to avoid cultural fragmentation and to be close to their people. “One of the phenomena currently afflicting the continent is cultural fragmentation, the polarization of the social fabric and the loss of roots,” the pope said Nov. 15 in the Clementine Hall of the Vatican’s Apostolic Palace. “This is exacerbated when arguments are fomented that divide and propagate different types of confrontations and hatred towards those who ‘are not one of us’, even importing cultural models that have little or nothing to do with our history and identity and that, far from combining in new syntheses as in the past, end up uprooting our cultures from their richest autochthonous traditions. Vatican City, Jun 6, 2018 / 04:26 pm (CNA).- Cardinal Pietro Parolin, Vatican Secretary of State, will take part in the Bilderberg Conference, an annual private gathering of global political, business and media leaders, set to take place this year in Turin, Italy, June 7 – 10. Cardinal Parolin’s name is included in the list of 131 participants in this year’s Bilderberg meeting. If his participation were confirmed, it would be the first time high-ranking Vatican official has taken part in the Bilderberg Conferences. Started in 1954 the Hotel de Bilderberg in Oosterbeek, The Netherlands, and named after the same hotel, the Bilderberg Conference gathers each year some 120 – 150 participants, among them European and North American political élites, along with industrial, financial, academic and media figures. The first meeting took place at the invitation of Prince Bernhard of Lippe-Biesterfeld. Co-founders of the meeting were Polish politician Jozef Retinger, former Belgian prime minister Paul van Zeeland and Paul Rijkens, who was then the head of Unilever. The original meeting objective was to strengthen US – European relations. Over the years, the annual meetings became a forum for discussion on a wider range of topics, from ecology to trade and monetary policies. This year’s meeting is set to discuss populism in Europe, the challenges of inequality, the future of work, artificial intelligence, US midterm elections, free trade, US global leadership, Russia, quantum computing, Saudi Arabia and Iran, the post-truth world, and other current events. The meetings are held under the so-called “Chatham House Rules,” an agreement typical of off-record meetings among academics or political leaders. According to that agreement, participants are free to use the information received, but they cannot disclose the identity nor the affiliation of speakers, nor can they disclose the other participants taking part in the conversation. Cardinal Parolin’s participation may be an expression of the “culture of the encounter” encouraged by Pope Francis. The pope has often asked officials to engage a dialogue with the world. The cardinal’s participation in the Bilderberg Group could be part of a strategy of dialogue the Holy See is engaging with small influential élite group. It is noteworthy that last year, Cardinal Pietro Parolin took part in the World Economic Forum in Davos, and there he delivered Jan. 19 a speech in which he listed the aims of pontifical diplomacy.